Great chance for Golfers and their non Golfers partners, 10 days package to Egypt. Play golf in Mena House Golf Course, Kattamiya Heights Golf Resort in Cairo. Royal Valley Golf Club in Luxor and Golf Resort at Soma Bay in Hurghada. tours to Egypt historical attractions are always available in private guided tours with expert tour guide to introduce you Egypt ancient history. Arrive to Cairo airport, meet and assist by your tour manager then transfer to your hotel for check in with an exclusive air conditioned modern van. Our rep will provide you with detailed info about your holiday itinerary advice all procedures and finalize all pick up time for your holiday time, overnight in Cairo. Breakfast at your hotel in Cairo and then met by your personal guide who will accompany you in day tour to the Great Pyramids of Giza and Sphinx, varying between six-thousand and even thirteen-thousand years old, and Valley temple facing the great statue. All places are wheelchair accessible. Lunch at a good quality restaurant. Then move onto the Egyptian Museum, well-paved place, where you can see the collection of Tutankhamen among other splendid pharaonic artifacts. Then transfer to see Khan El Khalili Bazaar. Overnight in Cairo. After breakfast, transfer to Hilton Pyramids Golf Course to enjoy (18 hole golf course). After that back to the hotel. Overnight in Cairo. After breakfast, transfer to enjoy the course at Kattamiya Heights Golf Resort (18 hole golf course). After that back to the hotel. Overnight in Cairo . Transfer to Cairo Airport for flight to Luxor. Checks in your hotel, then visit the Valley of the Kings, the Temple of Queen Hatshepsut and the Colossi of Memnon on the west bank. Cross the river to see the magnificent Karnak and Luxor temples. Overnight in your hotel. Transfer to the Royal Valley Golf Club, which offers wonderful views of Luxor west bank, for an enjoyable and challenging game (18 hole) to suit all calibers of golfers. Then transfer back to your hotel, Overnight in Luxor. After breakfast, transfer to the Red Sea resort Hurghada by an air-conditioned vehicle, about 03 hours driving. Check in your hotel and overnight in Hurghada at Marriott Hurghada Resort. Spend a thrilling game (18 Hole) at the scenic Golf Resort at Soma Bay. The naturally rolling couse features cascading water of natural streams. Then overnight in Hurghada. Transfer to Hurghada Airport for flight to Cairo. Check in your hotel and overnight in Cairo. All transfers to/from airport, hotel by a private A/C vehicle. 05 nights in Cairo hotel with breakfast. 02 nights in Luxor hotel with breakfast. 02 nights in Hurghada hotel with breakfast. All tours in Cairo and Luxor. Expert Egyptologist guide during tours. Entrance fees to all sites as per itinerary. 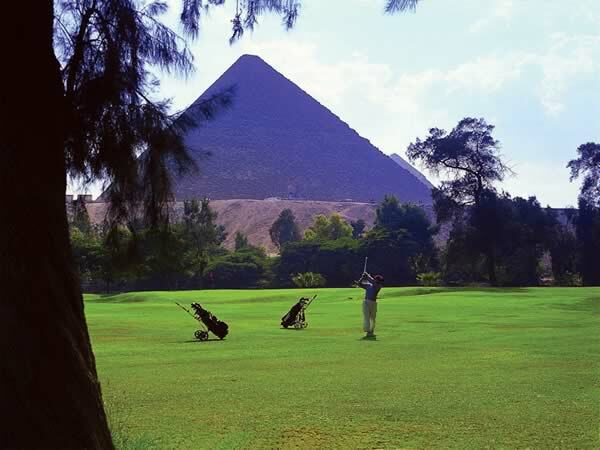 Green fees in Cairo, Luxor & Hurghada. Domestic flight tickets (Cairo/Luxor – Hurghada/Cairo). Lunch in 2nd and 5Th days. A bottle of water per trip in Cairo and Luxor. Free mobile phone during your stay (Charged about 30 minutes local & 02 minutes International).